Two weeks ago today my little boy had his second birthday. We’d decided to keep it fairly low key this year and just had some family and friends visit on they day with some fun days out before and after. 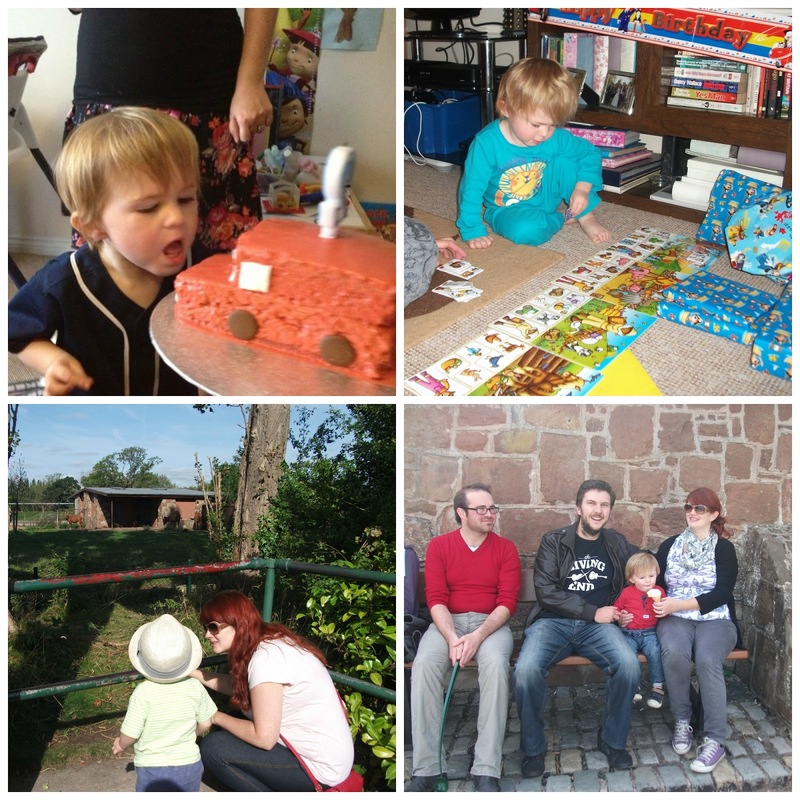 As we weren’t giving him a big party we had a day out to Chester Zoo a few days before just the three of us. It was lovely to spend a day out together and Lucas loved looking at the animals (although he did spend most of his time climbing rocks and stroking the floor!) We went round all the favourites; elephants, penguins, bears, monkeys, lions but Lucas seemed to prefer the flamingos to everything else. On his birthday we had a lazy morning in our pyjamas while he opened all his presents. This can take some time; everything he opens needs to be given the proper attention and be played with before we can move on. Grandma, Grandad and cousins visited for lunch and Nanny and some friends visited for tea. There was plenty of cake but we soon realised that Lucas hates people singing Happy Birthday; even the arrival of his Postman Pat birthday cake couldn’t stop him being grumpy. Second lot of visitors we didn’t sing and that seemed to be ok, hopefully he’ll have grown out of it by next year! That weekend we visited Great Nana and more family and had a picnic out at the woods and some ice cream down by the river. A perfect way to celebrate our boy turning two! Sounds like a lovely birthday! Shame he didn’t like the singing though. I love the Happy Birthday song, especially on my birthday lol. Thank you, he did and so did we! It was lovely, even only having a few visitors can be stressful I don’t know how I’ve cope when he has a full on party! What a great birthday – glad he had such a good time – belated birthday wishes. oh Hayley I am so sorry that i missed Lucas’s 2nd birthday ! I cannot believe how fast that came around! i must have missed your pics on IG that day too! soryy. still you made a fab Postman Pat cake even if he did not appreciate the singing lol!